Great cover for your portable seizure log book. Print on an 8.5x11 sheet of paper, fold it in half, and staple together with multiple seizure logging forms. Includes areas to write the volume number, logged events date range, and an if found phone number. Great for logging seizures when you don't have access to a computer. Print this form on both sides of an 8.5x11 sheet of paper, fold it in half, and staple together with multiple other printed sheets. Creates portable seizure log that mirrors the SeizureTracker.com online form. Great for logging seizures when you don't have access to a computer. Print this form on both sides of an 8.5x11 sheet of paper, fold it in half, and staple together with multiple other printed sheets. 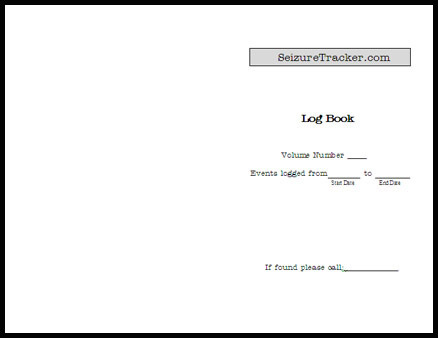 Creates portable seizure log that mirrors the SeizureTracker.com online form. 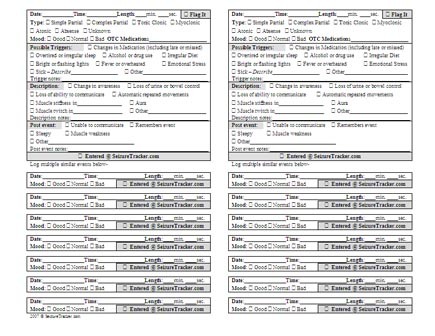 Two full event forms plus fourteen partial forms to log similar recurring events. Ideal for placing in a three ring binder. You can print multiple pages and leave with school or daycare provider. Mirrors the SeizureTracker.com online form. Great for logging seizures when you don't have access to a computer. Print this form on both sides of an 8.5x11 sheet of paper, fold it in half, and staple together with multiple other printed sheets. Creates a portable a infantile spasm log that mirrors the SeizureTracker.com online form. Great for logging seizures when you don't have access to a computer. Print this form on both sides of an 8.5x11 sheet of paper, fold it in half, and staple together with multiple other printed sheets. 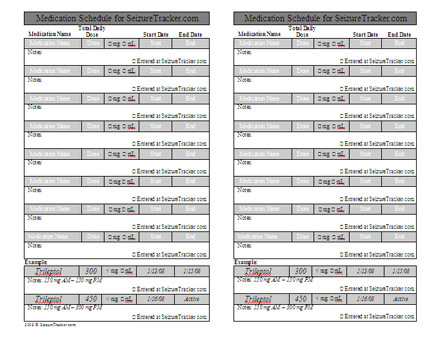 Creates a portable infantile spasm log that mirrors the SeizureTracker.com online form. Two full event forms plus eight partial forms to log similar recurring events. Great for logging seizures when you don't have access to a computer. Print this form on both sides of an 8.5x11 sheet of paper, fold it in half, and staple together with multiple other printed sheets. Creates a portable myoclonic cluster log that mirrors the SeizureTracker.com online form. Two full event forms plus eight partial forms to log similar recurring events. Work sheet and instructions on entering VNS setting information to the website. Designed to add to seizure logging book. Great for logging seizure when you don't have access to a computer. Print this form on both sides of an 8.5x11 sheet of paper, fold it in half, and staple together with multiple other printed sheets. Creates a portable VNS, myoclonic cluster, and Infantile spasms log that mirrors the SeizureTracker.com online form. Two full event forms plus eight partial forms to log similar recurring events. 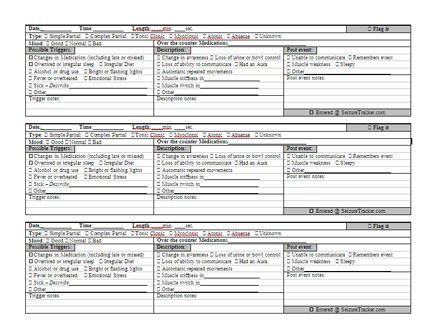 Work sheet and instructions on entering medication schedule information to the website. Designed to add to seizure logging book. 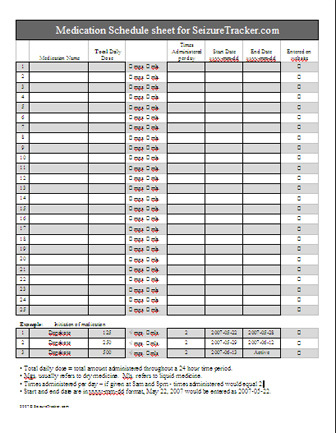 Work sheet and instructions on entering medication schedule information to the website. Work sheet and instructions on entering rescue medications information into the website. Designed to add to seizure logging book. Work sheet and instructions on entering rescue medications information into the website. 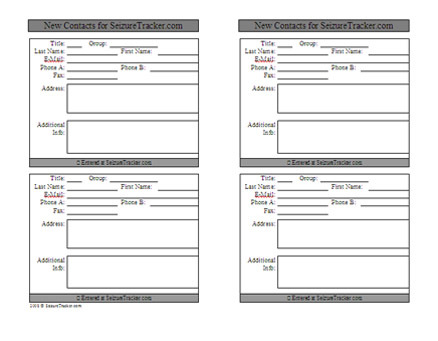 Great for collecting contact information (mirrors the add contact form on website). Designed to add to seizure logging book. Help spread the word about SeizureTracker.com. Posters and flyers are downloadable in PDF format and printable on any printer. 2007 - 2019 © SeizureTracker.com | All Rights Reserved.